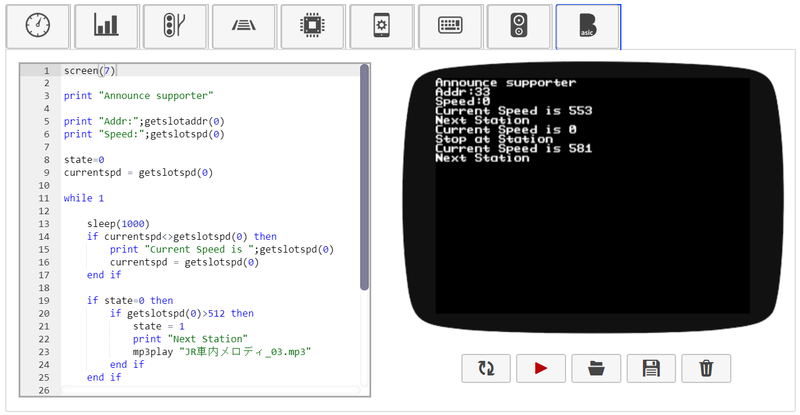 DSbasic is a very easy programming solution on your smartphone! This function works in DSair2's webapp on your browser. BASIC is very easy programming environment. DSbasic is implemented in Webapp control software. You can control automatically DCC and Marklin Locomotives on your smartphone. BASIC language powered by wwwbasic BASIC interpreter engine. Seperated Editor and Display. Easy to use. ACE based powerful text editor on browser. MP3 Play suported in MP3 files of FlashAir SD card. LocAddr is Locomotive address. Default protocol is DCC. If you want to control Marklin's, configure protocol on web app. The parameters of function mean as the followings. BASIC functions are described in wwwbasic user manual. print "Start BASIC Shuttle Control"
This automatic announce program is triggered by slot 1 speed. If you want to use comment, type like the following. DSbasic is powered by wwwbasic and Ace text editor.